Team Steven | Supporting Steven Wilson in his fight against cancer … can you hear us NOW?!? Thank you. Thank you for your big hearts. Thank you for your generous spirits. Thank you for your thoughts, prayers, love and support. 2010 was an incredibly rough year, and you all helped make the dark hours more bearable by pulling together in an amazing and universal way to support a remarkable young man during his battle against cancer, and then to ultimately embrace a family in pain after that sweet warrior laid down his sword, weary from his fight. We all send you our sincerest gratitude and good wishes as we embark upon the New Year. Steven’s mom, Denise, has written an emotional account of the past year entitled “Goodbye 2010,” telling you of her own gratitude, experience, thoughts and lessons. It is posted to our Facebook Team Steven page as a Discussion Topic, but I will include for you below. Your support has meant so much to her, to his dad and to the family. I have a little project for those of you who would like to participate. I know many of you were profoundly impacted in ways small and large by following Steven’s journey (for instance, I had a friend who quit her job and finally started her own business, and she told me it was because she was inspired by Steven – way to go, Kim! ; another just told me that next week he is donating his hair that he’s been growing out this year to Locks of Love in Steven’s name – awesome, Bill!). I told Denise that her Christmas present was coming in 2011 … I had so many people in 2010 tell me how much they were touched or inspired by Steven during his fight, and I wanted to create something tangible to show how much Steven impacted those who encountered his story, who learned special lessons, and who knew and loved him. He definitely left his footprint on our hearts. I am going to be putting together a book, THE LEGACY OF STEVEN TYLER WILSON, and I’m looking for YOUR words to fill the pages. Tell your story! Email a few paragraphs to VSARGE70@aol.com with the subject line “Steven’s Legacy” along with your name and city/state explaining how Steven touched you, made you think differently or changed your life. Perhaps it’s a funny old story you remember about Steven, or a new family tradition you started as a result of his battle, or something you realized about yourself and life, or even a poem or song. For me Steven was an incredible conduit who helped pull us all closer. I think we value one another more than ever. His life and short time here with us served as another reminder to embrace life and live it to its fullest … laughing, loving, forgiving and being grateful to those we cross paths with who touch our hearts. Steven remains a gift in my life, and I know he does in many of yours as well. May his beautiful memory always serve to remind us that we can face adversity with a smile and that the important things in life are worth a valiant fight. Wishing you all a happy, healthy and prosperous New Year! Thank you again for your support and love. This red stone was imported especially for Steven to create the perfect monument. First of all, I want to thank each and every one of you for being there for our family in 2010. Many of you still think of us often and continue to keep us in your prayers. We couldn’t have survived financially without your generous support. Gratefully, we didn’t have to worry about paying our bills. So far, I have not been able to return to work. I’m not so sure that I will. Looking back over 2010, all I can say is, wow. I experienced life and death and everything in between. While I continue living the ‘in-between’, I do so in a fog. I wish this page was Team Denise and it was I who experienced all the pain, sickness and death instead of my son. If you had asked me last New Year’s Eve if I thought Steven was going to die from this cancer, I would’ve said NO WAY! I thought his type of cancer was easily curable. That thought quickly changed on February 12th 2010. Steven Tyler entered St Francis Children’s hospital for what I thought was an ‘in and out’ procedure. But when I realized that we needed to take him to St Louis for another biopsy, I got a sick feeling in my stomach. Steven was checked out of the Tulsa hospital on February 15th, he was at my house for a couple of hours while we waited to go to the airport. He joked with the twins, and as I looked at him walking around the house I got a strange feeling that this would be the last time he would be here in my home. As we were loading luggage in our suburban, I got a feeling that this was the last time he would be standing in my garage. As we were riding to the airport I got a strange feeling it would be the last time Steven rode in my car. Later that evening, when we were sitting at Applebee’s eating dinner before we checked into St Louis’ hospital; I had a sick feeling this would be the last time he would dine out. Maybe it was just fear but the feelings were very powerful and real. Those fears were faced on May 21st. His story is told in the photos and pages of Team Steven. What you don’t see is the story of his parents and how we have struggled on a daily basis to survive. Concentration and memory are a thing of the past. I have to use a calendar to chart everything that has to be done whereas before I was always on top of everything. Now I feel like my brain is all mush inside. There are days that are wonderful and there are days that are dreadful. I found that I’d much rather sit at the cemetery in the scorching heat than in the freezing cold wind. I wish I could make the flashbacks stop. I can hear a noise or a phrase or see something on TV or around the house and I have a flashback of an episode of Steven in the hospital. I feel like I’ve been through a war. The endless days of watching him suffer and waste away to nothing but bones were too much for me to bear and the flashbacks continue to affect me every day. I didn’t celebrate Christmas this year away from my home. I needed the safety and shelter of my handkerchief and my own surroundings. Holiday decorations inside my home were scarce. Tomorrow the holiday season will officially be over and I can then say I survived the first one without my baby boy. It’s been seven months, 224 days to be exact, since Steven’s suffering was over. He now lives without pain, without medicine, without machines, without sadness. I can honestly say without any hesitation that I can’t wait till we meet again. I feel more love for others. I feel less stress because the worst thing that can happen to me has already happened. I’ve learned that there are so many petty arguments that aren’t worth fighting over. If someone isn’t bleeding, no one should get upset. The old saying ‘sticks and stones may break my bones but words can never harm me’ finally became true. I fell in love with Jesus all over again. I hope you all have a happy New Year’s Eve and an uneventful 2011. And as Steven would say … Live and have a good life and try to live as long as you can. Include a Note to Steven – Red Balloon Release THIS Saturday! We hope you will join us WHEREVER you are this Saturday, June 26, 2010 at 1:00 p.m. CST for the universal Balloon Release. As I reported previously, we will be releasing RED balloons into the air wherever we all are at 1:00 p.m. CST on Saturday, June 26th. Steven’s Aunt Dena said she’s going to put a note for Steven inside her balloon, and we’re all planning to as well. Maybe you would like to do the same, telling him how much his will to live inspired you or whatever impact he had on you. If you buy the balloons and can’t put the note inside, you can attach a little note for him to the balloon by punching a hole in it and tying it to the string. Children may especially enjoy coloring a little picture for him or writing a special note to attach to their balloons – teach them the value of life and talk to them about Steven’s amazing journey. Let them know that even when we lose loved ones, they are still with us in our hearts, and that releasing those balloons into the air is sending up love and honoring the memory of someone dear. Join us Saturday, June 26, 2010 as we once again release red balloons in honor of Steven! Steven’s mom had a great idea to include the website address our Team Steven page on Facebook to have people let us know if they find the balloon and tell us where it landed or where they found it. You might also want to include your starting location on there as well so they know where the release originated. “This balloon was sent up with love from Bristow, OK. If you find it and you’re on Facebook, look up our Team Steven page and tell us where it landed! Facebook link at teamsteven.wordpress.com” Or if they look up the group while on Facebook, it will be the first Team Steven that comes up, with over 3,000 members. If you post pictures of your balloon release to the Team Steven page on Facebook afterward, please be sure to include your city and state! Thank you to everyone who is joining in this moment as we all remember Steven. He continues to touch so many hearts. Thanks for keeping him in yours. HUGS! Greetings, Team Steven. Tomorrow marks the 1-month anniversary of Steven’s passing. As you can imagine, the family continues to grieve and misses that beautiful boy’s sweet smile. Days like today (Father’s Day) and tomorrow are especially hard. Thank you for your continued thoughts and prayers for strength for his parents, stepdad, siblings and extended family. We would like to invite you to join us in a universal Balloon Release this coming Saturday, wherever you may be. You can gather with friends or family in a park or backyard, or you can do it on your own. We will be releasing RED balloons into the air wherever we all are at 1:00 p.m. CST on Saturday, June 26th. On the 26th, it will be 1 month since we released the red balloons at his graveside service. This Saturday you will ALL have an opportunity to participate! It will be a great moment to send up some love to Steven and out to his family. Imagine his big smile as he sees all those red balloons rising to greet him up in Heaven! Feel free to take pictures and post them afterward to our Team Steven page on Facebook. So please … feel free to join us on Saturday as we celebrate the life of a young man who is so missed. I know Steven inspired so many along the way – this is your opportunity to pay tribute to him along with us. If Steven made a difference in your life, feel free to post your thoughts directly to the Team Steven wall on Facebook, or add your comments here. Thank you again for all of your wonderful support. Be well. On this Memorial Day weekend, we remember Steven and his valiant fight against cancer and infection. What an amazing kid. I thought the best tributes to share with you would be those written by his mom, all of which follow for you here. They will take you from his final week and beyond, and into healing in the form of a great new dog named Bubba. The healing part doesn’t come easy … it is with baby steps that parents try to move forward after the loss of a child. I am heartbroken for them, wishing there was something we could do to help, knowing it will just take time to get through. I remember when my friend Doug, lost his little girl suddenly to a condition known as ITP, where the spleen attacks the blood. Another classmate of mine from high school, Charise, had also lost a child and told him his daughter “will be the angel that watches over you now from a much better place.” She said it’s hard to think of God’s reasoning sometimes, but believes He must have an important plan in place for them. She told him nothing can take away the pain of losing a child, letting him know they still miss their son every day. She also said they take comfort in knowing God may hold him in His hands, but that they will always hold him in their hearts. And there is where Steven will always be: in all of our hearts. “Steven told me on Monday, May 17 that he was tired. I asked him if he was ready to give up and he said yes. I asked him if he was ready to go to heaven now and again he said yes. Tears started streaming down both of our faces and I told him I was too selfish to let him go. I told him that he had beaten the candida infection and begged him to fight just a little longer for his dad and me. He finally nodded ‘okay’. The next day, Steven again told me ‘I just want to die’…and again I begged him to keep fighting. On Wednesday I could see that the Sepsis infection was taking over, Steven had lost the fight to live. On Thursday the doctor told us Steven’s liver was shutting down. We couldn’t get ahead of the sepsis infection or the DIC. The doctors asked us if we wanted to revive him if his heart should stop. Steven had already given us his answer earlier in the week so we told the doctor that we would let him go peacefully. Up until the bitter-sweet end, Steve and I held out hope that the antibiotics would kick in and save his life. When Steven’s heart stopped at 4:43am on May 21, 2010, he was surrounded by his dad, his brother Rocky, his sister Whitney and me, his mom. We took off his bipap breathing mask and saw a smile on our beloved son’s face. I have no doubt he saw Jesus take him by the hand. That image will live forever in my mind. His eyes were fixed and happy and his beautiful red lips and white teeth were smiling at us. I kissed him one last time. Steven was a miracle. Please know that the cancer was gone, it was the sepsis infection and DIC that took him away from us. He is finally free from that hospital bed and for the first time in months, I don’t have to worry if he’s in pain. Steven with that great smile, hangin' loose in Hawaii before cancer struck ... his beautiful smile will be missed. I also wanted to share with you her plea for reassurance that Steven was indeed okay that was answered in a most interesting way … A heartwarming story of signs that are given when asked. This story was shared with everyone at Steven’s services. FYI – You might need a tissue after this one! “Today as I sat with Steven I cried. I cried so hard I thought my insides would burst. I prayed for a sign. Please God, give me a sign that you have Steven with you and everything is okay. It’s not fair! You gave Mary a sign three days after Jesus died…where’s my sign? You took my son too, and it’s been three days…where’s my sign? Please tell me my son is okay and he’s with you! I prayed that prayer and asked that question over and over. After pacing or sitting there with Steven for 3 hours I decided to leave and go down the street to my mom’s house to eat some spaghetti she’d prepared. My sister Dena was there and handed me a sealed envelope. Attached to the front of the envelope was a note from one of Steven’s teachers. And that’s just what he did. He lived a good life and he tried to live as long as he could. Up until the very end … until he was too tired to lift a finger or take a breath, Steven tried to live as long as he could. 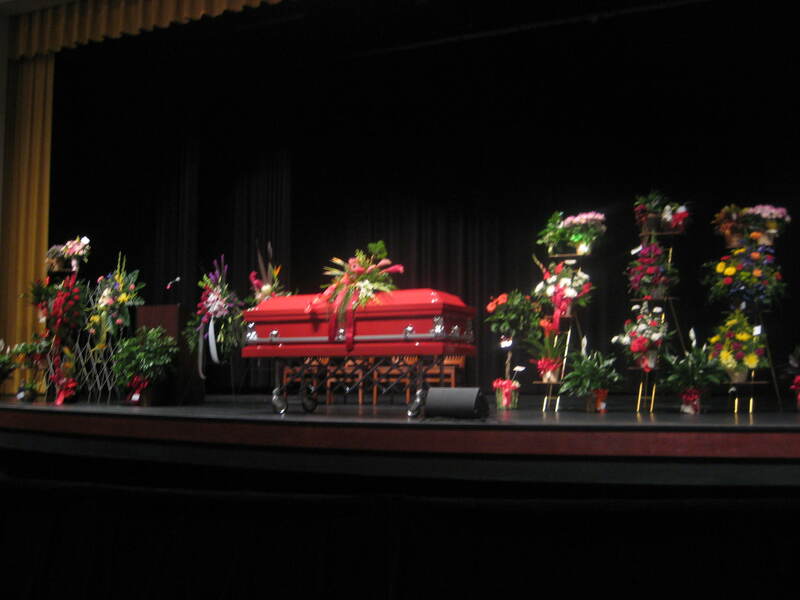 Steven's beautiful red coffin surrounded by gorgeous flowers at his services on May 26, 2010. “The twins are having a really hard time adjusting to Steven’s passing, especially Jaxie. The twins, who are now 7, have always begged for a puppy but I never had the time to deal with a dog. I was always too busy with my job to seriously consider getting the twins a pet. In fact, my 4 adult children were only allowed a dog or two growing up because I was too busy working and didn’t have time to deal with it. I also couldn’t bear the death of a pet. I went through several pets as a child and was devasted by each of their passings. I’m the type of person that lacks ‘coping with death skills’ therefore I’ve always avoided bonding with pets as an adult. Steven taught me that the most important job I”ll ever have is to be a good mom. It’s my new focus. Maybe a dog would help our family heal. We decided to get a male dog and name him Bubba. The twins called Steven ‘Bubba Steven’ so maybe having a Bubba to love wouldn’t be a bad idea. On Thursday we started dog shopping. I warned the twins that we are ONLY LOOKING and that it would be a couple of weeks before I’d be ready to bring a pet home. Ha! Famous last words spoken before we entered the Humane Society. In the top row, first cage was a silky haired dog with the cutest face. The twins were drawn to him like a magnet. they looked at the other dogs on display but always went right back to the first one. Jeff and Rock were hoping for the Cocker Spaniel in the end cage on the bottom row. But for some reason, the twins insisted our search for Bubba was standing in that first cage. I looked around at the other dogs and he was the only one with a red collar. He was also the only one that didn’t bark at us when we walked in. He was quiet, loving, and seemed to be smiling. We decided to take him to an interaction room and shut the door. He couldn’t stop licking our faces. He snuggled up to me like he was home. I looked over at Jeff standing outside the observation glass door and, like a 7 yr old, I begged him with my eyes to let us take Bubba home. Our search was over. We filled out the adoption papers. Immediately we were approved but we couldn’t pick up Bubba until the next morning because they had to place his microchip. We all were so excited. I never heard him bark the whole time we were there. We picked him up the next morning, signed the adoption papers and so begins our life with Bubba. He’s 18 months old, looks Havanese in the face with a West End Terrier/ Wheat mix. He’s already house trained. We’ve had him home since Friday and I still haven’t heard him bark. The twins said he barked once when the doorbell rang. Jaden and Jaxie greet Bubba, who is wearing a red collar as if sent directly by Steven! Below are the links to order your Team Steven items. Touched by Steven’s story, Team Steven member Amanda Kramer created all of these wonderful ways to promote our Team Steven network and support Steven during his fight and beyond. All commissions/proceeds from your purchases will go to the family. I am including the links on the sidebar as well. Additional information for donations to the family to help with medical expenses are also listed on the left side of our blog here as well. Once again, from the bottoms of our hearts, we thank you for your endless thoughts, prayers and support during Steven’s journey. Your words, cards and love all provided motivation for Steven to hang on a little longer, to continue to try to live as long as he could. They also provided much comfort for his family. We all appreciate it more than you know. Thank you for loving our boy. He was such a gift. Let his gift of appreciating life and believing in miracles continue to live on in you. Don’t ever take anything for granted. Fight for what you love. Love what you have. Live a good life and love others. That’s really what it’s all about. Saying goodbye … never an easy thing to do. Today was the day that we held Steven’s services and celebrated his life. But saying goodbye? No … I don’ t believe in that. I know better. I know that those who have to leave us live on in our hearts, and we don’t have to say goodbye … they are still with us in a different way, and we will see them again. Someday. We gathered at the Bristow Freeland Center in Bristow, OK, the same place where his benefit concert was held not long ago – so we filled an entire concert hall with wonderful people who all came to show their love for Steven! Many people wore red in his honor, since it was his favorite color. Red Team Steven bracelets were donned by many, and gorgeous floral arrangements surrounded his beautiful red casket on the stage. Pictures of Steven from the time he was a baby through his 18th year played on the screen before us, and we all got to see him once more as he grew from a boy into a man while the music played. One slideshow ended with Bad English’s “When I See You Smile.” Steven always had the most beautiful smile, and that is the smile that shines on in our hearts. I sat directly behind Steven’s dad, Steve, his mom, Denise, and my brother, Jeff – Denise’s husband/Steven’s stepdad. There was a moment where Jeff put his arm around Denise’s shoulder and pulled her closer to him as she cried, and he then reached his hand over and squeezed Steve’s shoulder. My tears started anew as I reflected on their journey together, and how tough this has been on everyone. This is not the way we wanted things to end, but in realizing it’s how things had to play out, there was some comfort in the fact that he lived longer than was supposed to be possible. Steven’s will to live inspired many and gave his family a chance to spend some important time with their son: 10 more beautiful weeks. He turned 18 and became a man. He had one last Mother’s Day with his mom. He got to spend time with his beloved relatives. He was surrounded by loved ones when he peacefully left this Earth. Steven was incredible. He was a miracle. He brought families closer together in love. Our families. Hopefully yours, too. At the graveside, we looked upon his beautiful red casket and felt the peace surround us. After a brief dedication, we released red Team Steven balloons into the air, as we sent up our prayers and love for our sweet warrior, watching them fly away and eventually disappear. It was poignant and hopeful, peaceful and pure. It was a final moment where we got to send up love and celebrate his beautiful life together. It was perfect. Team Steven "Can You Hear Us Now" Balloons released at the end of the graveside service. I have been a huge fan of the TV show, LOST. As the series finale came this past weekend, so many of the themes reminded me of our sweet Steven. It was about purpose and faith, testing and redemption, soul connections, letting go and moving on … together. Steven and his parents were tested by his illness. They all maintained their faith, and Steven’s will to live as long as he could was one of the most amazing and inspiring things for so many to witness. A little piece of all of us found redemption in our love for that beautiful boy. Today was a day of family, of coming together to let him go … physically, at least. The beauty of it is that Steven will stay with us, and the lessons he taught us about embracing life will remain. One day, he will be reunited with the wonderful souls who loved him so during his time here with us, where everyone can move on … together. Thank you for your thoughts and prayers of support that have been constant. Once I return to California, I will share with you a few things about his journey’s end, along with a lovely story about how his mother’s prayer was answered. I will also be posting a link for you to order any Team Steven items you may want (there are great hats, shirts, bags, cups, etc.) – all proceeds will go to the family. If you would like to sign the online guestbook at the funeral home, you may do so via the Steven Wilson link on the funeral home’s website: www.hutchinsmaplesfuneralhome.com – following is Steven’s obituary information. Thank you again for your love. Steven Tyler Wilson was born April 12, 1992 to Robert Steven Wilson and Tela Denise Sargent in Tulsa, Oklahoma. He departed this life in the early morning of May 21, 2010 at the age of 18 years. Steven attended Bristow High School where he was a Junior. As a child, Steven attended the First Church of God and later the Bristow Christian Center. Steven has been an active member of the High School Academic and Debate Team. As well, he enjoyed history, video games, paint balling and listening to his zune player. Steven will be most remembered for his beautiful smile; he will be missed by all who knew and loved him. 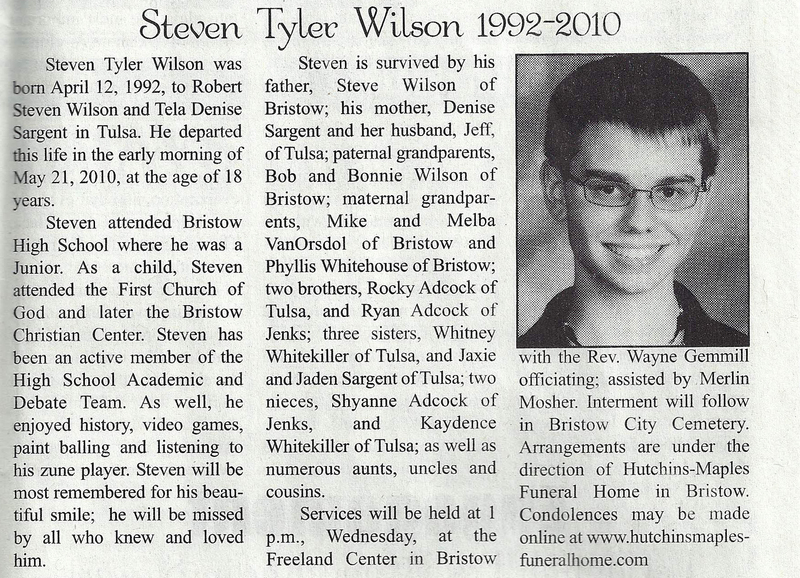 Steven is survived by his father, Steve Wilson of Bristow; his mother, Denise Sargent and her husband, Jeff, of Tulsa, Oklahoma; Paternal Grandparents Bob and Bonnie Wilson of Bristow; Maternal Grandparents, Mike & Melba VanOrsdol of Bristow and Phyllis Whitehouse, of Bristow; two brothers, Rocky Adcock of Tulsa, and Ryan Adcock of Jenks, OK; three sisters, Whitney Whitekiller of Tulsa, and Jaxie and Jaden Sargent of Tulsa; two nieces, Shyanne Adcock of Jenks, and Kaydence Whitekiller of Tulsa; as well as numerous aunts, uncles and cousins. Services were at 1:00 pm today, Wednesday, May 26, 2010 at the Freeland Center in Bristow with Reverend Wayne Gemmill officiating; assisted by Merlin Mosher. Interment followed in Bristow City Cemetery. For those of you who are not on Team Steven on Facebook, it is with an extremely heavy heart that I tell you our dear Steven Tyler Wilson passed away peacefully this morning at 4:45 a.m. His Aunt Dena said she knew after seeing him late last night that it was time to let go – he had fought so long and was so tired. Thank you so much to all of you wonderful people who have followed Steven’s journey so closely and who have extended such compassion to Steven and the family during his brave battle. Your support, cards, healing thoughts and loving prayers shared during Steven’s valiant fight against cancer and infection helped keep his spirits up and showed us all that anything is possible. Steven taught us all lessons about the beauty of life, the gift of people who truly love us and what it means to never take anything for granted. This morning on my way back to Tulsa, I have been touched and frequently in tears at the airports today when reading all of the messages on Facebook of how Steven has inspired several of my friends along with many people I don’t know at all who grew to love him (I write you now through blurry vision from Phoenix Sky Harbor airport, as I didn’t have time to update you before my flight). Steven has been such a gift to me and to our family. That boy was so amazing, and will live on in all of our hearts. I hope you will keep him in yours, too, and never forget whatever lessons you took from his brave journey. We now ask that you please pray for his brave parents, who have been by Steven’s side every step of the way, and for all of the family members who have been affected by this loss. Please keep everyone close to your heart during this difficult time and send loving thoughts. It is time for peace and comfort. Rest in Peace, Sweet Warrior. … for the breath that nourishes every cell in your body and has sustained you from the moment you were born. … for the miracle of your body that, despite whatever weaknesses or limitations, serves you and allows you to sense the wonders of the world. … for your brain that coordinates all the functions of your body without your even being aware of it. … for consciousness that allows you to perceive, feel, and be amazed. … for the eyes that allow you to see the abounding beauty that surrounds you – colors and shapes, the face of a loved one. … for the ears that enable you to hear birds singing, wind rustling in leaves, words people say to you, and the laughter of children. … for the sense of smell that allows you to enjoy the fragrance of flowers, the scent of fresh air, your favorite food. … for your mouth and tongue that enable you to taste the fruits of teh earth, to enjoy a ripe peach or chocolate melting in your mouth. … for the skin that protects you and yet allows you to touch and sense teh world, feel warmth, coolness, softness, and the touch of a loved one. … for your heart that beats faithfully your whole life, from even before you were born. Open to a sense of wonder and gratitude for the amazing gift of being awake and alive in this precious human form. The fact that we exist or that anything exists at all is a wondrous mystery. We all live in the midst of a miracle. Today Steven really needs ALL of the thoughts, prayers and good energy you can muster! THINGS ARE VERY SERIOUS. Please direct it all toward his liver! With all of the infection he has been battling, sepsis has set in and his liver is fighting to survive. Steven is fighting to survive. PLEASE send lots of love his way. The amazing power of healing energy and prayer has surprised us all on more than one occasion, and Steven once again needs your love RIGHT NOW! Yesterday Steven got another CT scan because his white blood cell & calcium levels keep rising, yet his albumin and hemoglobin keep dropping, so they knew something wasn’t right. The doctors have been working really hard to find the missing link. They wanted to revisit his abdomen area because his body keeps fighting an infection from something/somewhere and the Infectious Disease doc is exploring all possibilities. Steven has been on several antibiotics and was mostly lethargic yesterday. His body can’t recover from the Disseminated Intravascular Coagulation (DIC – inflammation in the body creating bleeding and coagulation issues, often caused by sepsis) which has been caused by the infection until they get rid of all the infections. Poor guy has been getting tired and discouraged. Knowing everyone is out there praying for him has helped. We really need those prayers more than ever. Please lift him up in light and love now. I have been dealing with deadlines and travels and have not been able to update this blog as frequently during the past few weeks, and Steven was making progress on a daily basis. Some days were steps forward combined with steps back, but always moving forward in some capacity. They never had to do exploratory surgery, as CT scans showed no tear or perforation in Steven’s bowels or intestines. Instead, they placed a drain tube in Steven’s tummy (just like a peritoneal dialysis tube) to drain the fluid and flush it with antibiotics. There was a rind of fluid that extended from his pelvis to his chest. In theory, the surgeon thought that at some point (probably back in February) Steven had a perforation in his small intestines and the body healed itself, but leaked outside the intestine. They think the body, trying to protect itself, sealed off that area allowing that pocket of infection to grow. All the anitfungals in the world would not make it go away unless you treat it directly, which is why they needed the tube to treat & get rid of it so his body could heal and recover. If you would like further background on Steven’s journey the past few weeks, I have included updates from her during the past few weeks. Meanwhile, THANK YOU for your continued love, thoughts and prayers. Please continue to send them to Steven and the family. Steven came through his procedure just fine today, on this National Day of Prayer. He didn’t have to go on the vent and is breathing on his own. He already looks better than he did yesterday. Let the healing begin! Steven had a good night however, he never gets quality uninterrupted sleep. I think it’s caught up with him because he’s been asleep now since 7:30ish. His lung X-ray looks better today so we pray that his lungs continue to recover. He’ll get dialysis this afternoon, his new drain tube is doing its job removing the infected fluid as they’ve had to empty the drain bag several times now. Hope to start Steven back on the NG feedings in a day or two and that he’ll get more and more healing slumber and not be in pain anymore. His heart rate is still really high and not sure of what’s causing that. He wanted to talk about his life yesterday and where do we go from here. He was relieved to know the doctors may have uncovered the mystery of his tummy fluid. He’s so precious… I’m so thankful to have him. Last night Steven told me he wanted to have pancakes with me for Mother’s Day. So today, when his doctor came in, I asked if it would be okay if Steven had pancakes with me this morning, he said sure! So I trot down the hall, take a shower, go to the cafeteria and come back up with 2 breakfast trays of pancakes…and t…he nurse tells me she had to call the doctor to make sure Steven could have the pancakes and the doctor said no, he misunderstood me… he thought I just wanted Steven to watch me eat pancakes? (um, ok, I bet his wife has a really hard time dropping subtle hints.) Poor Steven, he had his heart set on taking a bite of pancake. 😦 Happy Mother’s Day to all you wonderful moms out there! We found out this morning the infection is still in the tummy fluid. It took a few days longer than last time they cultured it to grow the yeast so that could mean they are making progress on it. They will do a CT scan tomorrow to see if the capsule of fluid is collapsing and healing or if they need to flush it with medicine. His lungs are so weak, it’s hard for him to cough all that junk out and when he finally stops coughing, he’s exhausted. His heart rate is still pretty high. He doesn’t feel that well, he’s felt nauseated a few times this morning. Please continue to pray for strength and for his lungs to get better. Thank you! Steven has slept most of the day today. According to the doctor, his lungs are getting tinsy bit better each day. He got regular dialysis along with 3 units of blood this morning. We are waiting to go to CT scan to see if the drain tube is draining all the areas in his body. If it’s not, they’ll need to place a tube in… each pocket that’s not connected to this pocket of fluid. (I hope that explanation made sense.) He looks stronger to me…but I can still beat him in arm wrestling. 😉 As always, thank you all so much for your prayers, the cards, and all the wonderful Mother’s Day wishes!! Sometimes it takes me a couple of days for something to sink in….I never said thank you! Please know that my mind is in a constant state of ‘thank you’ even if I don’t post it. The CT was done this afternoon. We should get full results tomorrow. His potassium level was too high so he is getting dialysis right now along with 2 more units of blood. His heart rate is really high and his blood pressure is dropping. I don’t think they’ll be able to pull as much fluid off of him as they wanted to his blood pressure won’t tolerate it. His platelet count is really low and he’s losing a lot of blood in his stool today. After dialysis is over (around 7:30pm) he’ll get platelets to hopefully stop the bleeding. His white cell count is high so we know his body is fighting an infection of some sort. One of the docs started him on an antibiotic today that he hopes will take care of any bacteria infection he may have. They really don’t know what’s wrong with him, but they won’t stop until they figure it out. He went without the bipap for about an hour this morning. His lungs are slowly getting stronger. His body is zapping the calcium out of his bones so he may be getting medication for that soon. It’s always 2 steps forward and 1 1/2 steps back. Pray on! His bleeding stopped after receiving platelets last night…that was a huge relief! His underlying issue is the infection which they are doing everything they need to do to make it clear up so hopefully when the infection is gone, everything will return to normal. He’s not getting dialysis today, he’s been breathing fine without the bipap mask since about 10:45 this morning but he will have to put it back on at night. His lungs continue to slowly improve. The CT shows a dense area in the lower left quandrant, they think it could be irritated lymph nodes from the infection. Steven is ready for wheelchair rides again. I’m going to ask the doctor today if it’s ok. His spirits seemed to wane this morning, I know he’s getting tired of being in the hospital, please pray for continued strength, healing and uplifted spirits. Thank you! Steven had a great afternoon and evening. His lungs have improved so much today they can hear air in the lower part of the lungs tonight! He’s still without his bipap and taking really good deep breaths. The nurse can even hear those much welcomed gurgling/rumbly sounds in his tummy areas which is usually quiet…but you didn’t need a stethoscope to hear it as I had already heard it earlier in the day as I was admiring his new bed. He got a clinitron rite-hite air fluidized bed. Google it. Seriously, the nurse might find me curled up by Steven’s feet like a dog. Today was a 2 steps forward day! Steven is chillaxin’ today watching Joe Dirt on his DVD player. Still breathing fine without the bipap. He asked for milk this morning….not just any milk, he asked me for ‘the natural white kind’ which means don’t give him 2% skim milk. 😉 He took a few sips and then wanted some water. His coughs have been very productive which will help keep his lungs clear. He’s getting regular dialysis today, he’s been urinating a lot lately so his kidney is still able to rid his body of fluid but it doesn’t clean his blood. That’s okay, we’ll take that! So far we’ve managed to hang on to those 2 steps forward from yesterday. I didn’t wake up until 8:45 this morning!! I grabbed my suitcase to head for the shower and as I passed the nurses desk I jokingly scolded them “I can’t believe you guys let me sleep this long”! They told me I was family now. 🙂 Yep, it’s another good day. Another great day in the corner suite. Lungs continue to improve and he’s been exercising his arms and legs on his own. He’s still off his bipap mask and has spent most of the day without his nasal canula. (He doesn’t like to wear it) If I could photoshop that tube out of his nose, you could tell how handsome he is. I told him he went into the hospital as a boy and will walk out a man. Here he is today. Check out our young man sporting a little moustache and goatee! Infectious Disease doc feels the candida infection is gone. It’s been over a week since we sent off the last tummy cultures and nothing has grown. YAY! Now the focus shifts to his body recovering from the infection. His body has been in Disseminated intravascular coagulation (DIC) (caused by the infection), for so long that we pray he is not too weak to recover from it. Please pray for strength and that his body overcomes DIC. His lungs are recovering and we need his strength to follow. From Code Blue to “I Love You” – Upcoming Exploratory Surgery – Send Love! On Friday, Steven was watching a funny movie on his portable DVD player – only comedies for that kid, to bring him some fun and laughter and make him feel good inside. He wasn’t ready to come off the vent at that point, but the doctor said they didn’t need to rush him. Physical therapy came by and worked with him for a little bit, and Steven started working out with 2 lb hand weights that his mom bought him Thursday; such progress from the Code Blue 5 days beforehand. Our warrior on Friday, April 30, 2010 "Chillin' like a Villain ... watching movies"
Article that was published in the Bristow Newspaper. On Saturday, Steven started the day strong, breathing on his own for over an hour. When they tested his blood gas, it was all normal. He got dialysis and Day 2 of his NG feedings went well. Later in the day, they were able to take Steven is off the vent and he was talking to his parents. When they pulled the tape back from his upper lip to remove his breathing tube, is mom said he had a mustache growing, so apparently the chemo effects are wearing off. Such a man! Steven was doing great again on Sunday. His doctor said the next step would be to wean him off the NG feedings & TPN and get him back on table food. His chest & neck were still sore from the tunneled catheter procedure a few days beforehand, and he was napping comfortably. It was good that he was resting to build his strength for more physical therapy on Monday. I talked to Steven’s stepdad, my brother Jeff, on Sunday night. I haven’t heard him sound that relaxed in months, and it was such a relief. He believes Steven is exactly where he needs to be and is confident in the doctors working with him. He said that Denise moving him to his side on Sunday morning and having him code were the catalysts in getting him to the right place to survive and recover. I am a firm believer that there are no coincidences in life, and that the right people are put into our paths when needed … it was time for a move to the adult hospital. Steven is surrounded by so much love on this journey, and things keep falling into place at the right time. Miracles continue to abound. On Monday, the cultures from his tummy fluid still reflected the Candida, but there was good news that the bacteria infection is gone, so he will be able to stop some of the antibiotics. The GI doctor thought about having Steven swallow a ‘camera pill’ to diagnose a problem in his intestines, but planned to wait a couple of days before that, since his stomach is just starting to move things through a little better. Steven’s lungs are still pretty weak, but he had some really good coughs yesterday. He was blowing bubbles through a bubble wand to increase the depths of his breath (thanks to their smart nurse for that great idea). Denise said she thought she was at a Lawrence Welk show. LOL. Please continue thoughts and prayers for lung strengthening and for his infection to go away. This morning Steven had some breathing issues from 3:30 to 5:30 a.m., and his heart rate was really high with his BPM around 40-50. The doctor said he didn’t feel Steven needed back on the vent and kept him on the bipap. They also took an X-ray of his lungs, which showed his lungs looked pretty good. They ordered more cultures since the infection and the 103 fever he was running would be another reason his breathing and heart rate could be so labored. He’s now off the bipap, his oxygen is at 100% and his breathing has slowed down a lot, so he seems to be doing much better. UPCOMING SURGERY – KEEP THE GOOD MOJO COMING! We now need lots of good vibes, healthy thoughts and focused prayerful energy for a successful surgery for Steven. A surgeon is coming by today to assess and discuss possibilities for exploratory surgery to find out what’s causing Steven’s infection. In doing this, they would be able to fix any problems while in there rather than utilizing the ‘camera pill’ (where they would have to wait a few days for results and it might not be 100% conclusive). His tummy fluid contains the candida, which they have pinpointed is coming from the intestines. Therefore, the only way to tackle this head-on is to do exploratory surgery. His mom said we have a few strikes against us right out of the gate: He has multiple system issues, kidney, liver, weak lungs and infection along with peritonitis. But the doctor also said the biggest thing in Steven’s favor is his youth. Being only 18 years old, he has proven time and time again that the young recover much better than the rest of us (we’re not old – deny, deny, deny!). I told her if we’re talking about strikes, sometimes you have to hit a few strikes before getting that home run! So batter up! Let’s figure out what’s up and knock this infection outta the park! Go Team Steven! Our brave warrior has come SO FAR!!!! Please send lots of love his way for continued miracles, further healing and successful surgery. Thank you for all of the warm thoughts, good energy and healing prayers you send to our sweet Steven. HUGS!!! This will be a lengthy update, as Steven and family have had quite the week since his scare over the weekend. Unfortunately I was traveling and did not have a chance to update all of you until now. Let me start by saying that despite the fact that things looked very dire on Sunday, the move to the adult side of the hospital was exactly what was needed. Steven has continued to make daily progress since then, and things are looking up once again. It has been another roller coaster week for sure. After such a trying weekend, we were stunned to learn on Monday that Steven’s dad, Steve, lost his job with JW Measurement in Bristow, OK after being with the company for 24 years. He had spoken to the HR department a few weeks ago and advised them of his desire to use his personal time off after FMLA expired. 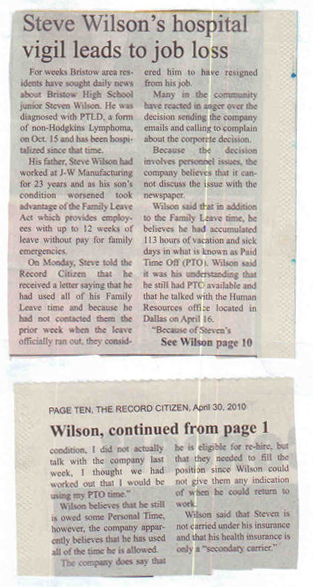 You can imagine the surprise when he received a certified letter dated April 23 in the mail on Monday stating his FMLA ran out April 21 and his position was no longer available since he didn’t return to work on April 22, even though he still had PTO available to use. Bristow, OK is a small town outside of Tulsa, and people there are definitely up in arms about this. The outrage extends far beyond Bristow, and many of our Team Steven members have already been sending emails and making calls to the company to express their displeasure at these actions. I have seen so many companies do the right thing in situations such as these, standing by their loyal employees, extending compassion and support when needed. To think that a 24-year employee doesn’t deserve some consideration in the face of such a horrible time is just awful. The newspaper in Bristow said the corporate office hasn’t responded and that their employees in Bristow can’t give out any information. Many of you have wanted to get in contact with the company upon hearing this news. For those of you who would like to email the company to share your thoughts, here is the email address to JW’s owner relation department: ownerrelations@jwoperating.com. The company phone number is 918-367-5523. Or donations can be made online via the “Donate” button here on the top left side of our blog. Thank you to those of you who plan to donate or who have already given money – your generosity is very much appreciated. Steven had an uneventful night Monday night and was resting comfortably on Tuesday as they waited for an X-ray of his GI tract. His parents were encouraged to see that the team of doctors on the adult side of the hospital was ready to tackle all of his issues. His blood pressure and breathing were better Monday, and he was down to 40% oxygen with hopes to eventually wean him from the ventilator. Though disheartened about the impact of losing Steve’s insurance at the end of the month (Denise and Jeff still carry insurance for Steven), the primary focus remained on Steven, as the branch of hope was extended again. The visitation is very strict on the adult side of the hospital, so Denise and Steve requested notification if anyone plans to visit. Only two people are allowed in the room at a time, and either Steve or Denise need to be present at all times in case nurses or doctors appear with news or questions. So there is no way to visit him in ICU unless prearranged. Denise said her dad tried his charm to try to allow more than two in the room and it didn’t work, so if HE couldn’t do it, anyone else is certainly out of luck! Given the risk of infection, it is probably for the best at this stage of the fight. On Tuesday the Infectious Disease doctor finally gave the green light for a tunneled dialysis catheter. His new GI doctor really wanted to find out what’s causing Steven’s stomach & liver issues, so the family was excited they were planning to look further into that. Steven had a CT done of his abdomen region. That night he looked a little unsettled, so Denise and Steve talked to him and explained what happened to him Sunday morning and where they were going from there. He seemed to relax a little more but didn’t sleep much that night. His mom was sure he was worried about upcoming procedures the following day. On Wednesday, Steven came through all of his procedures like a champ and was resting comfortably. He got a GI scope, followed by the placement of the tunneled dialysis port, and then they tapped the fluid in his tummy and drained a little over 2 liters of fluid from his abdomen. The GI scope didn’t show anything wrong in the stomach or esophagus, which was good news. His tunneled catheter for dialysis is located in his chest, a much better location than the temporary one in his groin area. As soon as he feels up to it, he will be able to get out of bed with this new location. So Wednesday was a great day for progress and a giant step forward for our warrior. That day his mom opened a letter from the Selective Service System addressed to Steven to let him know he’s officially registered for the draft. She marveled at what a milestone he had reached, guessing that it must be an automatic process now since they didn’t do it for him. She said, “He’s a man now. :dabbingeyes:” So cute. Today was another great day for Steven. They plan to start him on feedings through the NG tube, which should help a lot with the healing process and taking him off the TPN (nutrition via vein). His blood pressures are the best they’ve been in weeks! They tested the fluid in his lungs and it does NOT contain any infection so that is wonderful news. He was scheduled to get dialysis today. His mom said he’s communicating very well with nodding or shaking his head ‘no’ and using hand motions. She can no longer see the outline of every bone in his knees, legs and arms, and thinks he has actually gained a few pounds. The next step will be taking him off the ventilator, which he hates, so she’s sure he’s ready for that and knows it will be great to hear him talk again. Denise said, “His last words to me on Saturday were ‘I … don’t … want … to … be … a … burden … to … you … all.’ There is no way those are going to be his last words to me. NOPE NOPE NOPE NOPE!” Bless his heart. Nope, indeed! Not our warrior. Thank you for your continued good wishes for our boy. Last weekend we didn’t know how things would turn out, but this week things are looking up yet again. It truly is a miracle. I am awed by his fighting spirit every day, and am grateful to have his sweet inspiration in my life. Sending lots of love to Tulsa! (This update was sent out to Team Steven members on Facebook late afternoon on Sunday.) Hello all of you awesome Team Steven Members!!! I know several of you have been checking his page and may be aware of what’s going on, but in case you haven’t, we need LOTS of great thoughts and prayers for our warrior, so keep ’em coming! This morning Steven had to be revived around 7:45 a.m. He was moved this afternoon from the Children’s Hospial side to the Main Adult Hospital side ICU to begin to work the new treatment plan. He was put on a respirator to get rid of the carbon monoxide, and may be able to come off of the respirator within 24 hours. It will breathe for him and will keep the toxins from building up in his lungs and blood. They have started him on the new dialysis – SLED dialysis, which is similar to the way the kidney functions normally because it is slow. The doctors think this will slowly pull the toxins off his tummy and allow his body to possibly have normal breathing functions return. The next 2 days will be difficult and critical, but the doctors on the main hospital side have a Can Do attitude, and they don’t think what they’re dealing with now is terminal. They think it is chronic, and if we can get Steven through the next 2 days they think it can be overcome. There is definitely more hope, and we all know how Steven has already defied to many odds … please keep sending that good mojo his way, and continue with those wonderful thoughts, prayers and healing energy!!! They think he might come out of the drug-induced sleep this afternoon and become concious again. As far as the cancer goes, the levels are not a concern and are the least of their worries. Right now the liver, kidney, lung and fluid issues are the chief concern, and this team of doctors is used to dealing with every issue he has. Let’s give up some gratitude for all of the amazing caregivers Steven has had along his journey. May these new doctors continue to lead Steven down the pathway toward recovery. As always, thank you for all of the love, good wishes and prayers you have been sending to Steven and the family.